Presuming we haven't moved directly from a summer spent celebrating or commiserating over results to poring over the provisional performance tables from the Progress 8 machine, the autumn term is perhaps when we're our most enthused and energised, ready to meet our students and help broaden their horizons. It's our job: we teach languages. The problem is that as soon as we hit October, with the summer all but a distant memory, energy levels have begun to drain and, unless we make a real effort, enthusiasm wanes a little – not because we're not passionate about our subject, but because the fun of making resources is diminished as we're pushed for time, marking is in full swing, the first parents' evening may well have come and gone and reports are demanded from heads of year. We may be tired, but if we stick with our plan to establish the right patterns early on, both we and our students will feel the benefits later. So what can we do, beyond the excellent classroom teaching we deliver in our lessons? All of the following suggestions may seem a given, but it takes time and effort to ensure we’re actually doing them. Firstly, we need to ensure languages are used around school. Languages are living things; not just a subject for us, but part of our lives. We need to make sure they're always, in whatever small way, a part of school and student life until the bell rings at the end of the day, and encourage them after 3.30pm. Students need to hear us talking in our respective languages, to each other and to the teachers of other subjects who speak, even if only a little, another language. To make languages vibrant and relative beyond the MFL department, we could stretch this aural environment we’ve created to encompass a visual one. Many schools have a welcome sign in a plethora of languages, but what else? We can't rely on the lowly display board outside the Spanish room. Why not swap display locations? Our students will hear languages in their MFL classrooms and have that reinforced with what they see on display inside the class. 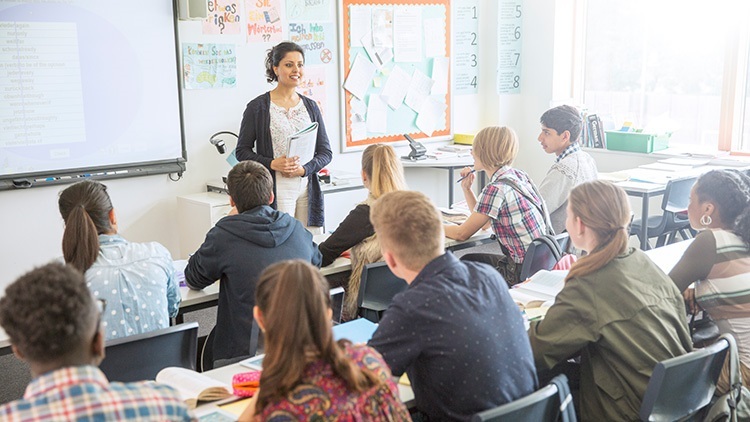 Why not exchange subject displays immediately outside the classroom with a different location, where students might ordinarily see something to do with history or science, so students see languages beyond the usual spots and consider them beyond Tuesday, lesson 3 and last lesson on Thursday. We shouldn’t ignore gains to be made in the virtual world, too. Your school might have a Twitter account, but does your MFL department? And even if it does, do you adequately exploit it? Is equal weight given to each of the languages you teach, or is there just one techie member of the department who you have to rely on for everything? Why not get them to offer a little CPD in a departmental twilight session so all members are equipped to extol the wonders of languages online? And whilst we're on the subject, why not think about more in-department CPD? Time is always an issue. We all have important deadlines, but we could offer each other short sessions on social media, planning a trip (it's sadly no longer a given and many colleagues relatively new to the profession have no experience of it) or something about the culture of the language we teach. If I still worked in schools with an Italian or Russian teacher, there are various cultural insights I'd love to have. Since so much of what’s been presented here is about what goes on outside the MFL classroom, why not extend it more broadly? This suggestion could split opinion, not because it's particularly objectionable, but once again because of the time involved. We could offer basic language classes to teachers of other subjects and even parents and carers. It fosters a stronger languages environment in school and better community relations beyond, helping parents and carers to have a better grip on subjects when helping their children with homework. It’s not just about helping everyone else. Despite the pressures on time and resources, we need to ensure we get enough time to experience the language and culture we teach. It's important we keep abreast of what's happening in the various countries in which our languages are spoken. It doesn't go without saying that we just know. If you teach Italian, Russian or even German in many schools, you could be the only person who speaks your language and you may well not be a native speaker with automatic links to a country. If we're trying to impress upon our students that languages are living things and need to be practised every day, we need to do the same. Ways to celebrate languages are important, too. We have a day to look forward to. The European Day of Languages is an opportunity missed in too many schools. It's mentioned, yes, and some schools are great about using it as a platform to further enthuse their students, but elsewhere it's considered too early in term to do anything really meaningful. That's not the case. Working with it can provide an inspirational topic for the end of the summer term, so Years 7 and 8, in particular, have something important to work on during a period in which work usually slows down after summer tests. These may seem somewhat obvious suggestions, but as the weeks tick by, it's sometimes difficult to see the wood for the trees. By making small changes to the way we do things, we are making a sensible investment in the future. The autumn term is hectic and tiring, yet full of potential and a time in which we can set patterns, which, if well-established, can create a culture of learning and engagement with languages that will help our students flourish.